Coys-Rent-A-Car who have been based in Torrevieja since 1992 are pleased to sponsor Torrevieja News. The best news and the best cars. FC Torrevieja lose at home to Alzira 0-1 whilst CD Montesinos crush TD Montesinos in their home game. “Home” although bot teams share the pitch! Interesting new tourism initiative for the salt industry in Torrevieja and a great shopping initiative. CD Montesinos 3-0 away win at Formentera keeps them in 2nd place, just behind Orihuela Costa. FC Torrevieja 1 Utiel 0 – great win that puts Torrevieja back in 4th spot just two points off the leaders. Everyone is invited to support the FC Torevieja club on their special fiesta style day at the Vicente Garcia on Sunday 11 November when Torry host Alzira. There will be paella free to all, with some super music to help create the winning atmosphere. So here’s to another home success. It all kicks off at 5.00pm. Good win for FC Torrevieja 2-1 v CD Castellón. CS Montesinos 0-0 draw at Rafal. MURCIA is the place to be this weekend if you enjoy military history. The CODEX BELIX ORGANIZATION are holding their 3rd re-enactment event in Murcia on the weekend of 12th to the 14th of October. The organization puts on a spectacular show of historical events, costumes, military hardware and military vehicles plus reenactments of battles and soirées for the public to enjoy. The centre of the event will be in the Malecon Gardens on Calle del Mason, where the Military Camps will be set up depicting the history of Spain through to World War 2 encampment, hospitals and memorabilia. CODEX BELIX have invited the International Veterans consisting of the Royal Naval Association, the Royal Marines Association, the Royal Airforces Association and the Royal British Legion Associations of the Costas to parade their Standards on the Sunday of their re-enactment weekend from the Malecon Gardens to the battle area in Teniente Flomesta Avenue. The Parade will be lead by the Torrevieja Pipes and Drums and the Orihuela Royal British Legion have invited a pair of Chelsea Pensioners to attend. The final act of the weekend will be a reenactment of the Battle Falaise in 1944, a decisive battle in which thousands of German troops were captured and their Panzer tanks were wiped out in huge numbers. The ‘Battle’ takes place at 1.00pm in Teniente Flomesta Avenue. The Royal British Legion, Orihuela Costa are running coaches to Murcia on the Sunday. For details of these or the event, please contact Eddie Coleman on 966733076. TORREVIEJA’S Paseo Vista Alegre promenade has been taken over this week by a huge marquee that stretches from the Habaneras Fountain at Eras de la Sal, past Real Club Nautico and the Casino, the start of the Book Fair. The VII Local Trade Outlet Feria features more than 40 Torrevieja shops during the five days of the Fair, which runs from October 10-14, 2012. The Fair is open twelve hours a day, from 10.00am to 10.00pm. This year the Fair will also feature children’s activities from Terra Mitica and Rio Safari Elche plus face painting sessions and inflatables. The event was officially announced last week by Councillor for Trade of the City of Torrevieja, Agustina Esteve, accompanied by the president of the Association of Small and Medium Businesses (APYMECO), Antonio Serna, Agustina The show returns for a second year to its origins, with over 40 stores that will be participating during the five days of the Outlet, which has a total of 89 stands. A diverse cross section of shops are featured from appliances to curtains, home decor, books, sports, computers, jewelry, fashion, shoes , perfumes plus a couple of catering establishments. A good win for FC Torrevieja 2-1 v Atlético Saguntino 2-1 at the Vicente Garcia stadium. The promotion favourites from the north of the province struggled against some slick play and two quality goals that put the home-side back into the hunt. CD Montesinos remain unbeaten in their group after three matches and also go joint top of the division. Two goals from last season´s top scorer, Edu, both being top notch finishes and one a piece from Victor and Andres, both penalties, gave MONTE a well deserved victory. The City of Truro Choir come to Torrevieja. Details here. Please find information concerning the forthcoming “FUN DAY” organised and presented by the ‘Torrevieja Stroke Support Group’, a local regsitered charity which offers vital support to those who have suffered a stroke as well as their families. The ‘Stroke Support Group’ works hand in hand with other local charities from their premises in Calle Paganini, Urbanisation La Siesta (Age Concern day centre and ‘Policia Local’). It is at these premises that this special ‘Open day / Fun day’ will take place from: 11.00h to 15.00h on SATURDAY 22nd September 2012. An admission fee of 3€ as well as all funds raised will be dediacted to the halep and support of those residents who have suffered a stroke. As well as, of course, information about the vital work which this local charity do, there will also be music, raffle, tombola, face-painting for children. Great win for FC Torrevieja – 2-1 v Crevillente. After 2 games they are the only team to have won both and sit top of the table. Early days but ….. The CoastRider newspaper invites you to the prestigious annual CoastRider Pride of Spain Awards 2012 on the 7th September 2012. For the sixth consecutive year we will be celebrating the actions and contributions of the Costa Blanca’s most inspirational residents in an unmissable evening of achievement and entertainment. For the last number of years we have taken pride in honouring courage, community spirit, hard work and of the Costa’s unsung heroes from both the ex-pat and Spanish community. We will be celebrating ten categories including Teacher of the Year, Child of Courage, Lifetime Achievement and Fundraiser of the year, and you can expect moving stories of incredible kindness and courage that will leave you inspired. The event is being held at the Municipal Theatre in Torrevieja and will start at 20.00hrs. The tickets will be priced at €6 which can be picked up from the CoastRider office, call now to reserve your tickets to this popular event on (0034) 966 701 060. San Miguel de la Salinas will be celebrating it’s annual fiesta from the 9th September to the 7th October 2012. During the month long celebration they will honour both the saints; San Miguel Arcangel on the 29th September and the Virgen del Rosario on the 7th October. There are parades, music, fireworks, wacky races, markets and exhibitions and a lot more. The 7th Outlet Feria of Guardamar del Segura is being held on the 7th, 8th and 9th September 2012 in the Plaza de la Constitucion right beside the church, town hall and tourist office. There will be furniture, textiles, clothes, shoes, bags and general items all of which will be heavily discounted, some by up to 70%! Just coming to an end is Formentera del Segura’s annual fiesta in honour of San Roque and San Miguel. On Saturday 1st September events start at 11:00am Parade by the Big Heads, Flutes and Drums through the streets of the town, at 11:30am Games for the children throughout the day at the Plaza El Secano with a Midnight Firework display. On Sunday 2nd September at 2:00pm Firing of rockets and ringing of bells finishing at 7:00pm with Traditional Games and Chocolate at the sports area next to the centro socicultural Los Palacios. The Zenia Boulevard Shopping Centre opens on the 26th of September. The biggest shopping centre in the Alicante province has confirmed that it will be opening its doors on the 26th of September. More details soonest. Ars Aetheria Symphony Orchestra confirmed for 15th September in the Municipal Theatre. Tickets via Servicam. Excellent 4-0 victory against UCAM last night. Very impressive. TONIGHT, Wednesday 8th Torry take on UCAM from 2B, in their second home friendly. The game kicks off at 8.00pm in the Vicente Garcia and admission is just €5.00. Simple Minds in concert in Alicante on 11 August is CANCELLED! FC Torrevieja returned to their home stadium, Vicente Garcia, on Saturday evening to play Real Murcia ‘B’. Around 300 faithful turned out to watch the team easily defeat the Murican Third Division side, in their second of six preseason warm up games. The final score was three:nil but Torry could easily have scored six, while their defense only looked troubled on a couple of occasions late into the second half. For the record books, Torry’s goals were scored by Burguillos, Gash and Rafa. Come and join CRUSHED ICE at our regular Friday night gig at Mosquitoes bar, La Florida (opposite the Abbey Tavern).. Classic Rock from the 70`s and 80`s plus a few of those great 60`s tunes as well, it all kicks of at 9-45pm, see you there!! Our latest newsletter is out – enjoy! FC Torrevieja’s first pre-season friendly ended with a 4-0 away win with lots to be positive about. The list of friendly games continues to grow with the first of these on Saturday 4 August at home, in Vicente Garcia to Real Murcia ‘B’ from the Murcian Tercera group, followed the following Wednesday 8 August, again at home to UCAM Murcia, who this season will play in Segunda B, having finished sixth in the Murcian Tercera last season and have somewhat controversially taken the place of Orihuela, who were runner up in Segunda B! However Orihuela were demoted to Group 6 with Torrevieja, due to not being to raise the €200,000 deposit required by the Football federation this year. On Saturday 11 August Torry are away to Thader (Rojales – local Regional Preferente team) and on Wednesday 15 August they are away again to Pinatar (San Pedro) – Murcian Tercera team). Kick off times for Home games is at 8.00pm at the Vicente Garcia with entrance priced at just €5.00. and say “hi” – that costs nothing and means so much. FC Torrevieja fixtures are now out for 2012/2013 – it’s a huge league with 22 clubs, so 42 games to play! 28th July – MABS Charity Day, Iceland, San Javier. Iceland have asked the Club to attend this event as a “show and shine”. We shall be meeting at the Lo Monte Hotel at 11.00am with the aim of arriving at Iceland at 12.00pm. Iceland have advised that there will be a BBQ available. Need a disco this summer? What about Disco 007? The 5th annual International Choral Workshop are meeting and rehearsing together in the Hotel Cabo Cervera in La Mata during the week 30th July-4th August. On the evening of Saturday 4th August the 50+ singers will perform a concert of the music they have been working on all week. This includes popular favourites from Les Miserables, Cats, Merry Widow, Glamorous Night, and a special arrangement by Nigel Hopkins of Andrew Lloyd Webber & Gary Barlow’s Jubilee Song “Sing”. There will be several solo items which course members will have worked on during the week, and we can promise you a real end-of-season rousing concert to send audiences into their summer holidays with a smile on their faces. Tickets are just 5€ – and are available from course members or on the door. To have tickets put by and guaranteed … please telephone 966 775 976. The acclaimed Orihuela Costa Male Voice Choir, under their conductor Nigel Hopkins, are playing host to the visiting Welsh ladies’ choir, Cor Merched Persain at La Zenia church on Sunday 29th July. The concert, which starts at 20.30hrs, will include a varied mixture of music from both the ladies’ and men’s repertoires, and include many Welsh favourites and popular songs specially arranged by Nigel Hopkins. Those of you who were fortunate enough to hear the Male Voice Choir’s inaugural concert in May will remember what an exciting sound the men can make. They will sing a mixture of popular songs and famous Welsh hymn tunes. Tickets for the concert are 5€ each and are available from CALLNET Internet Cafe, behind Consum next to Paddy’s Point – Telephone: 966 761 171, or on the door. Proceeds from the concert are in aid of the new church building fund. 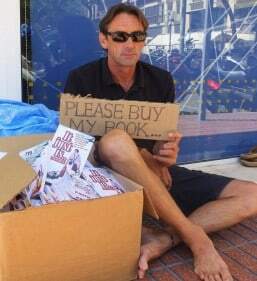 PLEASE buy my book! Dave Bull’s famous book enjoys some fresh marketing! WELCOME RETURN TO TORREVIEJA FOR WELSH LADIES OF CÔR MERCHED PERSAIN. The ladies of Wales based choir, CÔR MERCHED PERSAIN will be making a welcome return to Torrevieja this summer. Having previously visited the ‘city of salt’ as a choir, the Welsh lady choristers have chosen to return during late July in order that they may enjoy, this time as spectators, the town’s “International Habaneras Competition” as well as, of course, the Mediterranean summer sunshine. However, during their visit, Côr Persain will also offer a concert in the prestigious seafront cultural venue of the ‘CASINO’ (Sociedad Cultural Casino de Torrevieja). TUESDAY 31st JULY 2012 at 21.00h. Admission Free. Cor Persain is a Ladies’ Choir based in Ty Croes, a village near Ammanford in South West Wales and established in 2000 by a small group of ladies who just wanted to get together and sing. As Cor Persain has increased in numbers, so has their repertoire, now presenting a full range of styles of music from early medieval to present day. To date, their engagements have included concerts to raise funds for charities, their regular Christmas Carols by Candlelight, St David’s Day Cawl a Chan in addition to private recitals and weddings, and are more and more in demand as their reputation speads. Splash Finca Panoramica – worth checking for outdoor activities. Near Benidorm. LIVE at Bar Irlanda, Almoradí on 22ND July @5PM, Dublin v Meath VS. MEATH in the Leinster Football Final. Bar opens @4.30PM. Another great win at football – this time by the Spanish U19s in the UEFA Championships in Estonia. Jesé from Real Madrid scored the only goal in the 83rd minute against a stubborn Greece side. Congratulations. Sadly the ladies U19s went down by the same score against Sweden in injury time. Ah well, well done to get to the final in Turkey. The second half of July offer a full range of activities for all the family. Fresh from performing at a Royal Garden Party for Charles and Camilla, the fantastic Helson School Jazz Orchestra perform in the Teatro Municipal at 8.30pm with tickets priced at only €3.00. They are also performing in La Mata on Thursday at 10.00pm. On Friday July 20 there is a very special performance by the Orquesta Sinfónica de Torrevieja celebrating a unique style of Spanish music the Zarzuela. The show starts at 10.00pm in the Teatro Municipal with tickets priced at €10 and €15. Torrevieja Open Saturdays is back on July 21 from 5.00pm until 9.00pm in the town centre. Remember that all day parking from 10.00am until 10.00pm is available in El Arco, Marina Salinas, Virgen del Carmen and Marina Internacional for just €1.00. Lots to see and do, not to mention the shopping! There is a quick change of bands in the Teatro Municipal as at 9.00pm on July 21, for the ‘Concierto Extraordinario’, featuring the Alicante Youth Orchestra under the direction of Francisco Maestre. The evening will feature classical pieces from Mozart, Bizet, Korsakov and others. Tickets are €10.00. And for a complete change of scene, you may wish to head over to Disco Oz, because at midnight there is a special disco featuring ‘Imparable’. Two more musical performances for you on Sunday July 22 with the Benefit Gala for the Cofradía del Cristo de la Flagelación in the Virgen del Carmen at 8.30pm with over in Teatro Municipal at 9.00pm there is the V Aniversario del Orfeon Municipal Ricardo Lafuente, organized by the Patronato Municipal de Habaneras. Torrevieja’s major music festival starts on Monday July 23 with the opening of the 58 Edition of International Polifonia and Habaneras Competition. This week long competition features choirs from all five continents, along with local performances from Torrevieja choirs, outside of the competition. 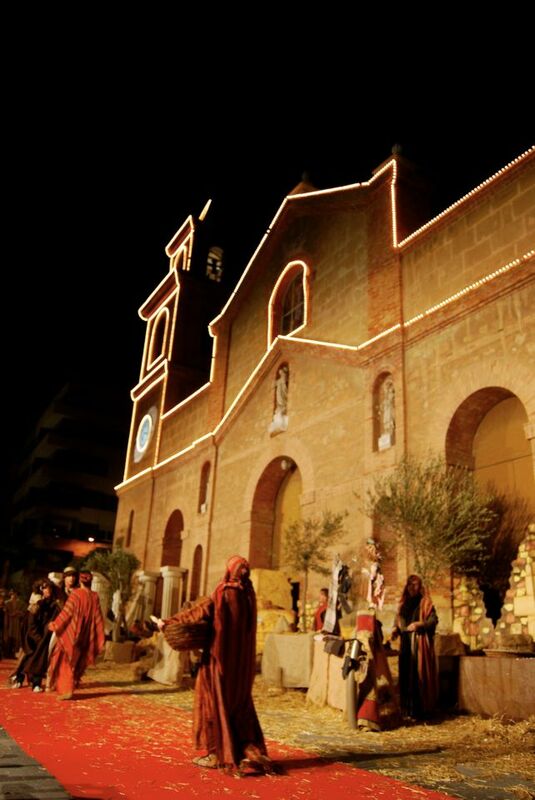 The event takes place in the historic and iconic Eras de la Sal with performances starting each evening at 11.00pm. Another choir, this time from Wales will bring the month to a close on Tuesday July 31, when the ladies choir Cor Merched Persain perform in the Cultural Casino of Torrevieja at 9.00pm. The Sunday Drivers Club returns after a month’s break, moving to the cooler evening schedule, combining it with Noche del Coche, Car Night. It’s a fun and informal event open to owners of all kinds of interesting cars, vans, trikes, motor bikes and scooter from classics, through exotics to tuned and customised cars. The Tuning boys and girls are more than welcome to bring along some neon lights and lambo doors along with American Muscle cars, Italian Exotica, Hot Hatches, Classic British, Mini Coopers, Radical Racers, Harley Davidson, Choppers and Cafe racers; all are invited to a fun night out. Entry for cars and visitors is free. Lots to see and do in Torrevieja this July. Mozart, Bizet, Korsakov and others. Tickets are €10.00. And for a complete change of scene, you may wish to head over to Disco Oz, because at midnight there is a special disco featuring ‘Imparable’. Two more musical performances on Sunday July 22 with the Benefit Gala for the Cofradía del Cristo de la Flagelación in the Virgen del Carmen at 8.30pm while over in Teatro Municipal at 9.00pm there is the V Aniversario del Orfeon Municipal Ricardo Lafuente, organized by the Patronato Municipal de Habaneras. Huge amount of activities in the coming weeks as the “season” kicks in. Spain wakes up as European champions. The game was the most watched game ever on Spanish TV, beating this week’s Portugal match. Campeones!!!! Champions! 4-0 victory against a demoralised Italy means that Spain retains the title. Great work guys!! This coming Saturday, 7th July, the “Torrevieja – Open Saturdays” shopping campaign, which coincides with the summer sales, has a unique event which should be of interest to all, especially the British community – cricket in the street!!. Instead of a typical, English village green and the sound of ‘willow on leather’, the Torrevieja Cricket CLub have organised a four-way knock out tournament of specially adapted “STREET CRICKET”. This fast and furious version of the game will see teams from San Fulgencio, San Miguel de Salinas, La Manga and hosts Torrevieja, competing for honours. The game starts at 18.30h and will continue until around 21.00h. The ‘town centre oval’ is situated in the pedestrianised street Calle Concepción. So, it’s Spain v Italy, who we have already met in the championships 1-1 on Sunday. It will bring Spain to a stop (again! )The game last night was the most viewed game ever on Spanish TV. Sunday’s will no doubt break that record! HUGE night – Spain v Portugal in the semi-finals of the European Championships. A por ellos! HELSTON SCHOOL JAZZ ORCHESTRA RETURNS TO TORREVIEJA FOR SUMMER CONCERT TOUR. One of the United Kingdom’s most accomplished youth jazz bands, the HELSTON SCHOOL JAZZ ORCHESTRA, from Helston, Cornwall, have chosen once again, the ‘city of salt’ for their annual concert tour and will perform in Torrevieja during the month of July. On Friday night, in the Virgen del Carmen, Torrevieja’s Municipal Dance Schools offer ‘Versatile Dance’, a show covering many different dance styles including Oriental, Flamenco and Rock’n’roll. There is dance with a difference on Saturday as the musical ‘Quiero ser Artista’ is performed by Baile Payas in the Municipal Theatre. Both shows start at 9.00pm. On Monday, June 25, 2012, a magnificent Summer Festival will start at Marina Salinas in Torrevieja. The Fiesta will start at 12 noon with a fair to be located in the parking lot of Marina Salinas and at 15 hours the music starts. And from 16 hours you can enjoy live music from different local artist. The official inauguration begins with a parade to the stage from the famous group Torrevieja Pipes & Drums, following a short performance of Celtic music and with this act the festival will be opened officially. Throughout the day you can enjoy lots of music from local artists and some of them are already much known from other festivals on the Costa Blanca. The above attached links show only some of the artists scheduled to perform during this mega event that will last three days in this magnificent place. This festival is a perfect opportunity to enjoy good atmosphere in a magnificent surrounding. Remember Bargain Books on C/Ramon Gallud is your one-stop store for all English-language books as well as greeting cards and stationery. Good news is that there is now one hour free parking outside the shop on a trial initiated by Torrevieja Council. Huge win against Croatia by the tightest of margins, 1-0, ensures Spain progress into the quarter finals as group winners ahead of Italy who beat Ireland 2-0. Tonight, they will know their opponents from Group D. It could be France, Ukraine or England – Sweden are already eliminated. A por ellos! We have availability in most categories from the 16th until the 30th June. July and August will be very busy and if you are likely to need a car, we’d recommend that you reserve now via the updated website. Just a note to remind you of the concert to be offered by the “CANTERBURY CHRIST CHURCH UNIVERSITY BIG BAND” in the bandstand of the Doña Sinforosa park (near to ‘Acequion’ beach and the International Marina (where there is ample parking) in Torrevieja on SUNDAY morning 17th June at 12.30h. This concert is FREE. The band will also offer a concert in aid of the mentally handicapped association, ADIEM, at 2.30h on THURSDAY 21st June in the main TEATRO MUNICIPAL. Tickets are priced at 5€. The Spanish papers are full of “must do better” about the national team after a 1-1 draw. Cesc saved the day after starting as a “False 9”- an experiment that failed in most people’s eyes! Oh well, we only need to win the next two games to get through! Spain start their defence of the European Championships tonight versus Italy. The Torrevieja bars will be busy no doubt! No Puyol, no Villa and Torres struggling. Will we be strong enough to retain the title? I think so. Kingsbury Dance Acadamy of Cabo Roig will be performing in Torrevieja next week, for one night only, so now is a good time to think ahead and book your tickets. The event is to celebrate their end of course production and this year they chosen that timeless favourite; “Alice in Wonderland”. Academy owner Ruth Kingsbury has specially been adapted for the size of the stage and to showcase the abilities of their team of dancers. The show will be performed on Tuesday 19 June at the early evening hour of 6:00pm in the Virgen del Carmen Cultural Centre in Torrevieja. The children, ranging from 2-16 years, have all be rehearsing hard and this special performance of “Alice in Wonderland” will showcase ballet, tap, modern & street dance plus of course acting and singing. Once again the children wanted to help local charity APANEE which helps underprivileged children and families struggling in the current climate and all proceeds from this one night only show will go direct to the charity. Last year they raised €500 and are hoping to raise more this year. The children would love you to come and see and support their production and tickets are reasonably priced at just €3.00 and can be purchased at the box office outside the Municipal Theatre Tues-Fri 11:00-1:00pm. Don’t forget – HUGE “Party in the Park” on Sunday …. details below. As the title suggests this year´s Rascals variety show contains music, dance & comedy from various popular musicals. These include “Hello Dolly”, “The Sound of Music”, “Brigadoon”. “Anything Goes”, “Starlight Express” & “Mama Mia” to name but a few. For the first time Rascals have invited the Carmen Lorente Dance School to perform in their show. A pantomime with singing, acting, dancing. Children from the age of 3 to the ages of 16 taking part. Children from all nationalities involved. Ballet, Tap, Modern, Jazz, Street Dance, gymnastics, singing and acting!!! Torrevieja – Open Saturdays shopping campaign, continues this SATURDAY 2nd JUNE in central streets. – A ‘gardening workshop’ offering displays and demonstration about gardening at home. A ‘Cupcakes and fondant’ demonstration and workshop. (both events for adults). A demonstration of make up, including ‘makeovers’ for volunteer participants, a demonstration and ‘competition’ of bodybuilding, a performance of modern dance by the ‘Paya’ school of dance. “Games without Electricity” is an initiative for children and younger people – typical, ‘older’ games which used to be played in the street before the introduction of internet and video games! 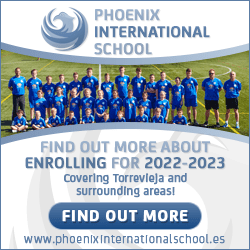 Details of Torrevieja’s summer soccer schools have been announced. Four separate options here. FC Torrevieja play their final game of the season on Sunday 13th at 5pm via Mislata. Go along and support the boys who have over-performed this season. Great hopes for next season. CD Montesinos are away at Rafal. Cavalcade leaves Los Montesinos at 5pm with a 6pm K.O. 7 May The TorreGolf Society have announced a special Jubilee Golf Day on June 1 at Monforte Del Cid. Interested in a great “Red, White and Blue Day”? Contact me as below. On Sunday, May 13 at noon, exhibitions of Spanish horse riders up to 4.00 pm. 9.00 pm – Performance of Maria del Angel dance academy and at11.30 pm – Closing of the May Fair with the final concert by the Rociero choir and the Masa Coral José Hodar choir. Don’t miss it and make sure you take your camera to capture this most colourful of events, second only to the Ferias in Andalusia itself, in size and spectacle. Thursday, May 10. 9.00 pm – performance by the local dance academy Paya´s and its flamenco group. Friday, May 11, 9.00 pm – Performance by the Rosy Sancho dance academy and 11.00 pm – Concert by EL ARREBATO. Saturday, May 12, noon – Mass at the Inmaculada’s Archpriest’s Church sung by a Rociero choir. Parade up to the door of the church, welcome to authorities and congregation and then parade up to the fair facilities. Once there, entrance of Spanish horse riders up to 4.00 pm. 9.00 pm – Performance by the Lola Morales dance academy and at10.30 pm – Concert II concurso de Copla, all with free admission. At midnight Grupo Flamenco Azahara will perform. May Fair 2012, will be held on Wednesday 9 to Sunday May 13, 2012. Everything takes place in the tradition setting in the Port area, where you will be able to enjoy non-stop sevillanas and eat at its marquees. Around 9.00pm the fair will be inaugurated, with a firework display and the symbolic switching on of lights. Entrance to the Fair Ground is free although tickets are required for the seated area. If you have not visited the Fair before, put it in your diary now, as this is one of the most colourful fiestas in Torrevieja and includes a display of horses and carriages on Saturday and Sunday, singing and dancing each evening (be warned it starts late!) food, food, food and a libation or two. European Day proper starts at 10.30am on Wednesday May 9, in the Plaza de la Constitución, where Scottish piper, Willie Hume will announce the start of the celebrations. At 11.00am, the traditional civic act will take place with the presence of the Mayor of Torrevieja, Don. Eduardo Dolon Sanchez. This, of course, will be the first time that Eduardo has presided over the EU day celebrations as Mayor. Eduardo will be joined by representatives of the local European community who will offer their own interventions before the official raising of the E.U. flag to the ‘Hymn to Europe’. This will be followed by dancing and music, until around 1.30 pm. 1 May Details of European Week are coming through. Excited to hear about the new Oval Track being built near Cartagena. Please do NOT drive the Coys Rent A Cars around the track! Drive them TO the track ….but not around it! Next game at the Vicente Garcia for the last match of the season is against relegated Mislata – 5.00 pm k.o on Sunday 13 May. FOOTBALL is an important part of life for hundreds of children in Torrevieja. Be one a fan of Real Madrid, Barcelona or even FC Torrevieja, every player out there gives their respect to one man, the Captain of Spain and possibly the best goalkeeper in the World, Iker Casillas. 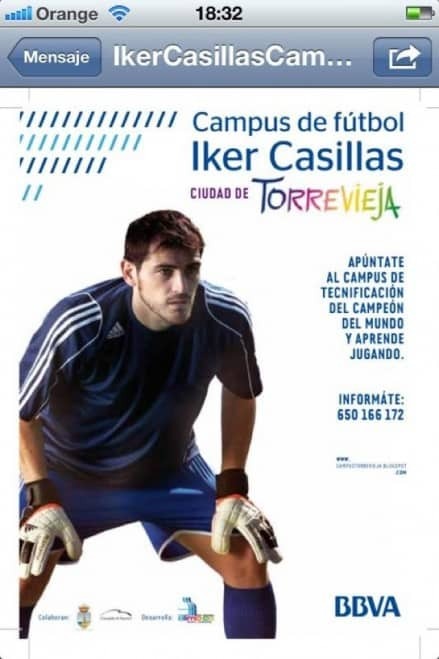 Players in Torrevieja are about to become very excited because on Monday evening, Torrevieja’s Councillor for Sport, Olympic Gold Medal Winner Dani Plaza announced through his Twitter and Facebook page that Iker Casillas would be bringing his Football Campus to the City of Salt this summer. The Football Campus Iker Casillas is an international project aimed at all children between 6 and 16, regardless of their qualities, abilities and capabilities. The Football Campus Iker Casillas is not intended exclusively for goalkeepers, but for any position. Each day, under the guidance of Iker Casillas himself plus professional sports coaches, children can enjoy playing their favourite sport. More details here. A great win at promotion rivals Alziar (2-0) keeps FC Torrevieja in the hunt. CD Montesinos also beat the team they share the pitch with TD Los Montesinos 4-1 to stay in their promotion chase. Tough at the top! On 29 April FC Torrevieja are home against league leaders Catarroja. This will see the return of Petu, who was a big hit with the Torry fans and who scored the winner at the Mundial 82 in December for Torry, prior to his transfer there in January. This match will be a Dia del Club, with season ticket holders paying €5.00 and all others €10.00. It will be the game of the season and should be spectacular. Please set the date in your diary and come and support a truly genuine squad. THERE never seems to be a dull moment when it comes to following the pearls and tribulations that go with FC Torrevieja. Their season seemed to be all but over when they succumbed to a last minute, injury time goal at Castellon in midweek, which all but ended their chances of making the top four but undeterred, Torry kept alive their slim hopes of play off football with a thrilling 2:0 win over Atlético Saguntino at a rain-drenched Vicente Garcia on Sunday. 19th to 29th April 2012 Thursday to Sunday. One of Torrevieja’s most successful innovations is the Tapas Route, which is run twice a year around the city centre. The Torrevieja’s Tapas Route 2012 will be celebrated Thursday to Sunday, from the 19th to the 29th of April 2012. The time schedule established to celebrate this Torrevieja’s Tapas Route will be from 12pm to 4.30 pm and from 7.30 pm to 11 pm. The price per tapa and drink (half a pint/small beer, wine, water or soft drink) will be 2 euros. Date: from 19th to 29th april 2012 Thursday to Sunday. Timetable: from 12pm to 4:30pm and from 7:30pm to 11pm. ANTIC AUTO is the largest classic, vintage and antique car show in the region, with many other activities, music, kids stuff, demonstrations all there to pass away a couple of hours or more. There are sales of classic and vintage cars, motorcycles and spare parts, clubs and associations, journals, magazines, kids toys, organizations and institutions, old toys and collector’s items, clothing and accessories. It takes place on April 14 and 15 at the IFA Exhibition Centre, located beside Alicante Airport. On April 14 it is open from10:00am to 8:30pm and on Sunday from 10.00am until 7.00pm. In the adjoining building to Antic Auto is the first collectors and antique fair to be held at the IFA. It features clubs and private sellers and exhibitors of such items as weapons and equipment, stamps, old books, toys, watches, dolls, records, coins, comics and pens. The entrance fee is €7.00 euros to both shows with discount details available here. Everybody is saying what a tremendous success the Semana Santa processions were this week. Congratulations to all involved. FC Torrevieja win again to move within 3 points of a play-off place – this time 3-2 v Borriol. The dream is alive! Choirs from Italy, Germany, Valencia and the Canaries are all set to perform in Torrevieja’s from the 13 to April 15. Torrevieja’s Councillor for Culture, Luis Maria Pizana, accompanied by the president of the Coral Francisco Vallejos, Gabriel Samper, and the director of this Coral, Aníbal Cano, on Monday presented the 26 edition of the International Choral “Ciudad de Torrevieja”, which be held at the Municipal Theatre and will include, besides the Children’s Choir and the Choir “Francisco Vallejos” of Torrevieja, choirs from Italy, Germany, Valencia and the Canaries. On Friday April 13 at 9:00 pm, the Municipal Theatre will host the Opening Ceremony Concert, involving the Children’s Choir “Francisco Vallejos” The Coral Francisco Vallejos, and The Blossomed Voice (Italy). On Saturday April 14 at 9:00 pm, the Dómisol Sisters (Valencia), Camerata Lacunensis (Canary Islands) and Niniwe (Germany) and on stage, while on Sunday at 9:00 pm the closing Gala, with the participation of the four invited choirs, will take place. The Easter weekend sees the Torrevieja Cup being fought for with hundreds of boys and girls from many parts of Spain. It is based at the Sports centre and the Nelson Mandela stadium. The Torrevieja Spring Cultural Programme is announced. Something for everybody here. ANTIC AUTO is a must for lovers of classic and antique cars. It takes place on April 14 and 15 at the IFA Exhibition Centre, located beside Alicante Airport. On April 14 it is open from10:00am to 8:30pm and on Sunday from 10.00am until 7.00pm. This is the largest classic, vintage and antique car show in the region, with many other activities, music, kids stuff, demonstrations all there to pass away a couple of hours or more. There are sales of classic and vintage cars, motorcycles and spare parts, clubs and associations, journals, magazines, kids toys, organizations and institutions, old toys and collector’s items, clothing and accessories. More information here. One of Torrevieja’s most successful innovations is the Tapas Route, which is run twice a year around the city centre. The Spring edition of Torrevieja’s Tapas Route 2012 will be celebrated Thursday to Sunday, from the 19th to the 29th of April 2012 and the various, bars, cafes and restaurants will be open for Tapas from 12pm to 4.30 pm and from 7.30 pm to 11 pm. The price per tapa and drink (half a pint/small beer, wine, water or soft drink) is just €2.00. It’s a fun and inexpensive way to spend an afternoon or evening, touring the centre of Torrevieja and discovering some of the hidden delights of the city. Participating cafes, pubs and restaurants will be announced next week and all participants can vote for their favourite Tapa, and in doing so, after you have collected 10 official stamps on the Tapas Route Card, be entered into a prize draw for a number of great prizes. A great event that many other local communities have also copied, and it is a success wherever it is held. Queen’s Diamond Jubilee” in Torrevieja. The event will be celebrated with a “street party”, but in the Jardin de las Naciones park, throughout the evening of Sunday 3rd June 2012. From around 17.00h on this Sunday afternoon, everyone is welcome to turn out at the park. Bring your own ‘picnic style’ food, tables & chairs provided as well as ambiental music of the era, games and family fun, a variety of performing artists including a ‘grand finale’ concert offered by the Phoenix Concert Band accompanied by local choirs. Bunting a Union Jacks are a must!! Bar facilities will be available. For now, please make a note in your diaries. More details of this special celebtration will be circulated as they become known!! COME ALONG TO THE “PARTY IN THE PARK” to celebrate Queen Elizabeth II Diamond Jubilee!! Sunday 3rd June from 5.00pm. Amazing game for CD Montesinos 4-4 draw with 5 players and a number of officials sent-off! FC Torrevieja 2-1 over Villarreal C leaves them in 7th place. This week: 01/04 12:00 SC Requena – FC Torrevieja and CD Montesinos play San Miguel with a 5pm K.O. San Miguel are the only team to be CD Montesinos all season so it should be interesting! “Recent statements in the English press on the Costa Blanca may have led to the impression that AECC’s Prostate Testing in the area has now stopped – this is not correct. The chairman of ‘F.C. Torrevieja, Vicente Boix, has asked me to let you know that the home game this weekend will take palce at the Vicente Garcia stadium at 12.00h on SUNDAY 11th March. This inportant match is against Muro football club, currently in fourth place in the league but only a handful of points ahead of us. A win on Sunday could well reanimate FC Torrevieja’s hopes of making the ‘play offs’ for promotion at the end of this season. Entrance for non season ticket holders is 10€. After the game and inside the stadium, there will be a BBQ available to all those wishing to particpate. The cost of the BBQ, including drinks is a reasonable 5€. Many will have heard rumours of the demise of Auriga car hire. These are now confirmed. If you have any car hire requirements please do not hesitate to contact us as above. FC Torrevieja got a welcome away win, whilst CD Montesinos drew away from home. This match will now be played at the Instalaciones Municipales de Orihuela Costa (Playa Flamenca area) on Sunday 4th at 12 noon. Confirmed. Jove Espanyol v FC Torrevieja is also a 12 noon Sunday K.O. Handball comes to Torrevieja this week with the biggest competition of its kind, the Copa del Rey. As hosts of the tournament, the Torrevieja Handball Club are drawn against Aragon on Thursday 8 March at the Palacio de los Deportes Infanta Cristina. Full details here. The Torrevieja based cultural association, “Interculturarte” is in the process of setting up a new initiative which may be of interest to individual musicians, bands, choirs, etc BASED IN TORREVIEJA. The first compact disc “Musica Torrevejense 1”, will be recorded and produced over the next few months and all musicians, bands and choral groups are invited to participate. Once the first CD of the first 12 songs has been produced, it is intended to commence another, (‘Música Torrevejense II’) thereby offering the opportunity to as many local (Torrevieja) musicians as possible. Each participant, be they individual or group, will be required to pay a ‘one off’ fee of 60 euros to cover initial costs. In return, each of these participants will record TWO songs and receive 10 copies of a CD (and the ‘master’) of their two songs. Later, ONE of these songs will be included in an album of 12 songs (i.e. one of each of 12 participants). It is intended that the completed CD will be presented during a gala to be held in the autumn in a municipal venue with the participation of the recording artists. For more information and to enrol as particpants in this project, please contact me via the contact form below. Torrevieja’s next game is against Jove Espanol, Alicante, on Sunday 4 March with Kick-Off at 5.00 pm in the Ciudad Deportiva, San Vicente. Torrevieja now sit seventh in their division on 51 points, seven points off a play-off position. For the most part, they are not in a play-off position having lost four key players to higher-ranking clubs, due to a lack of finances and it is doubtful that even if they were to be promoted that they would have the revenue to play at 2B level! FC Torrevieja scraped a hard-fought 1-1 home draw against Novelda with a rare Córcoles goal whilst CD Montesinos continue their winning ways in another tricky local derby. They stay top. So, a successful ThisIsSpain Exhibition. Congratulations to Christine Roche, the organiser. Apologies …. a number of posts seem to have “self-deleted”. They seem only to have been on events that have passed so I will not re-post them. I will be careful to check that this does not happen again. Update from the weekend games. FC Torrevieja got a valuable point at high-flying La Nucia whilst CD Montesinos stay top of the table after their game with Thader’s second string. CD Montesinos have confirmed that the home match this coming Sunday will be a 4.30pm. Alicante CF play FC Torrevieja on Sunday at 12 noon. The venue is to be confirmed. Please contact me for further details. This coming Sunday, 5th Feb 2012, CD Montesinos are at home against Benejuzar in Match day 18. Kick off for this game has now been confirmed as 16.15 (4.15pm). A 4-1 win for CD Montesinos keeps “Monte” top of the table. As you are, no doubt, aware, ‘World tree day’ is almost upon us!! In order to celebrate, the Ayunatmiento of Torrevieja is organising a tree planting initiative to which EVERYONE is welcome to come along, plant a tree, enjoy some good company, (bring your own picnic if desired…….etc). This community event will take place in the ‘Parque Molina de Agua’, the protected park / dunes area between Torrevieja and La Mata, near to the ‘Mississippi River Boat Restaurant’ (look for the crowds), on SATURDAY 4th FEBRUARY at 11.00h. The Mayor of Torrevieja, Eduardo Dolon, will be on hand to plant a tree or two and there will be personnel on hand to assist with digging holes etc (although of course, you can bring your own shovel). Please consider supporting this event as individuals or in groups as clubs / associations. Monica Llorente, the ex-mayoress of Orihuela, makes some pretty amazing disclosures about the finances of Orihuela Council in RTN this week. Not good! Not pretty reading! There is also an interesting article about the development of the Neighbourhood Watch scheme on the Costa Blanca. I would say, “enjoy” …..but you know what I mean! Coys Cars will be exhibiting at the next ThisIsSpain Exhibition 24/26th February at Orihuela Costa’s La Zenia Hotel. More details soonest. Mixed fortunes for the local football clubs. FC Torrevieja lost away at Llosa and are tumbling towards mid-table whilst CD Montesinos won 2-1 to stay top of the table. A long way to go so both clubs will hope for three points next weekend. Torry’s next home game, this Sunday at The Vicente Garcia is against Eldense with a 5.00pm kick off. There are problems off the field too. The President of the club met with players on Monday evening to advise them that the subvention funding from the Town Hall was being cut and that they would have to manage with reduced wages for the remainder of the season. They were also told that should they have an offer from another club, then they would be allowed to leave without obstacle. On Tuesday Nico departed for the Murcian 3rd division, then on Wednesday leading club goal scorer Petu was signed by rivals Catarroja. Specsavers are having an Open Day on the 26th at their branch near the Habaneras Centre. Free eye-tests – details here. At Fitur in Madrid, Torrevieja announced an important new attraction – the Torrevieja Nautical Experience. It’s good news day! The long awaited 4 star hotel at Los Balcones, Torrevieja is confirmed. Opening is planned for Easter 2012. Let’s hope there are no last minute hitches. It is to be called Hotel Spa Doña Monse. A most welcome addition to the the town’s hotel offer. Exciting news re Torrevieja’s first ever Time Bank. It works a bit like bartering but it is time you exchange rather than goods. You could exchange an hour of English conversation for an hour of Spanish or you could exchange an hour of gardening for an hour of baby-sitting. Full details here. We are all saddened to hear of the death of Robbie France who was a regular contributor to the EWN and who lived in Puerto de Mazarrón. His music lives on. R.I.P. CD Montesinos are at home on Sunday 22nd against Sporting Saladar, a game that corresponds to Match Day 16. Kick off for this game will be 4pm. The FC Torrevieja game has yet to be confirmed. FC Torrevieja could only draw at home today 0-0 and are now out of the play-off places in 8th position in the table. CD Montesinos are now top of the table after thrilling 4-3 win. The winner came in the last minute seconds after Rafal had equalised. FC Torrevieja are home tomorrow with a 5pm K.O. against UDJ Barrio del Cristo. Three points are vital to stay in the hunt at the top of the table. CD Montesinos play an hour earlier against Rafal and are hoping to keep at the top of the table. The ever-popular ThisIsSpain exhibition will take place at La Zenia Hotel, Orihuela Costa 24th – 26th February 2012. Coys Cars will be there. Help At Home Costa Blanca is growing in strength, number and awareness around the Costa Blanca, with the latest area to be incorporated, Quesada, where they are developing a new group of volunteers to cover this area more efficiently. They are seeking more interested people for different posts within Help At Home and have arranged a meeting of volunteers for 18 January, 2012 at 3.00pm, in Lo Marabú Restaurant, on the Lemon Tree Road. Help At Home have a UK / Spanish qualified nurse, a Volunteer coordinator plus a number of volunteers, one of whom is a retired Nurse, while her husband is a retired ambulance driver. These amazing people have volunteered to help those in need of a little free time, time for themselves away from their normal day to day caring duties, through the help at home short term scheme, whatever age or nationality the carers might be. TWO capacity houses filled Torrevieja’s Municipal Theatre on Friday January 6, for the popular New Year concert. The recently formed Torrevieja Symphony Orchestra, directed by José Francisco Sánchez put on two shows, at noon and 7.00pm and as in the past couple of years, the quickly sold out for this popular first concert of each New Year. CD Montesinos drew 2-2 at Alberterense to stay top of the table. On Sunday 15th they are at home to Rafal at 4pm. The Coys Rent-A-Car Newsletter Number 3 is out. If you would like a copy sent to you, please contact us at the office or leave a message in the contact form (below). So, this is it – the day all the Torrevieja children have been waiting for. The arrival of the The Three Kings. The town centre will be full tonight – have fun and take care. THE WAITING list for surgery at the Hospital of Torrevieja has increased by 126% compared to a year ago, according to a report issued this week. The report states that the number of patients who are waiting to be operated on stands at 1,450, which is a ‘considerable increase’ on the number reported in January 2011. This situation has in turn brought delays of up to 60 days for surgery, which is well beyond the recommended maximum of 30 days that is required by the Valencian Ministry of Health. The Ace Café event is held on the first Sunday of every month at the same venue. Their Majesties, the Kings of the Orient, Gaspar, Melchior and Balthasar, will arrive at 17:30-hrs on January 5th to be greeted by hundreds of children before making their way through the streets of the City via the Old Man of the Sea Monument, Calle Ramón, Cajal and Zoa, along Ramón Gallud, finishing at the main facade of the Church of Immaculate Conception, in front of Constitution Square. Everybody at Coys Rent-A-Car wishes all their clients, friends and suppliers a healthy, peaceful and prosperous New Year. Let us hope that 2012 brings us everything we would wish ourselves. Spanish classes at all levels will re-start in January in Restaurante La Rústika (formerly Los Arcos) near the town centre.